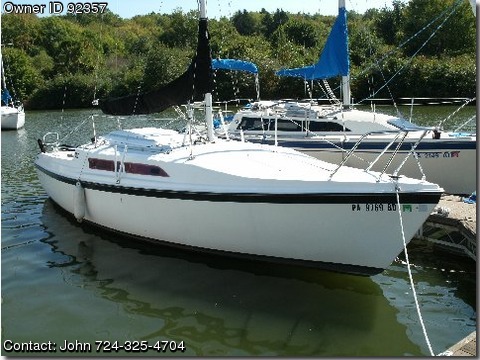 1988 MacGregor 26' sailboat with trailer. Length 25' 10", width (beam) 7"9", draft, board up 12", draft, board down 5'9", water ballast 1150 pounds, permanent ballast 300 pounds. Easy to trailer with boat weight 2550 pounds and standard trailer weight 530 pounds. Boat is in very good condition and ready to sail – always stored indoors during winter. Includes all interior cushions (sleeps 6) and full set of cockpit cushions, covers for winches, main sail, tiller, and motor, inside carpeting, dinette table, pop top enclosure, Origo 2-burner alcohol stove, sink, porta potti, stereo radio, boom vang, swim ladder, anchor, and ton of extras and spare parts. Sails include main, jib, and 150 Genoa.. Outboard engine is a 9.9 hp Yamaha electric start with heavy duty 12 volt battery and 6 gallon fuel tank. Reconditioned trailer – paint, padding, new wiring, bearing buddies, and new tongue..